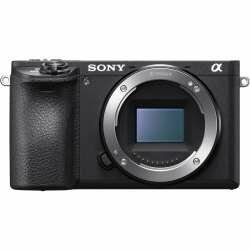 The Sony A6500 Mirrorless Camera is a professional-class APS-C interchangeable-lens camera featuring unbeatably fast autofocus, High-density Tracking AF Technology with comprehensive phase-detection AF point coverage, enhanced buffer for continuous shooting at up to 11fps, 5-axis optical image stabilisation, and touchscreen focus control. Fastest (0.05s) AF with 425 phase-detection AF points Built-in 5-axis image stabilisation 24.2-megapixel Exmor CMOS sensor for outstanding light sensitivity BIONZ X image processing engine for superior detail reproduction 4K movie recording with full pixel readout/no pixel binning Features 24.2MP Exmor CMOS image sensor The Sony A6500 features an APS-C image sensor with approx. 24.21 effective megapixels plus thin wiring layer and large photodiode substrate for light collection efficiency. Combined with BIONZ X image processing engine, the image sensor achieves a wide sensitivity range of ISO 100-512002 with low noise. The sensor’s quick-transmission copper wiring layer helps the camera to shoot movies in 4K and Full HD at 120fps (100fps). 425 phase-detection AF points with High-density Tracking AF Technology With 425 focal plane phase-detection AF points helping to provide distinctively wide and dense AF point coverage, the Sony A6500 focuses accurately, efficiently and reliably on subjects throughout the frame. ance plus the BIONZ X image processing engine’s highly efficient, accurate handling of information. This makes for extraordinarily fast, accurate AF and tracking performance when shooting movies or stills.